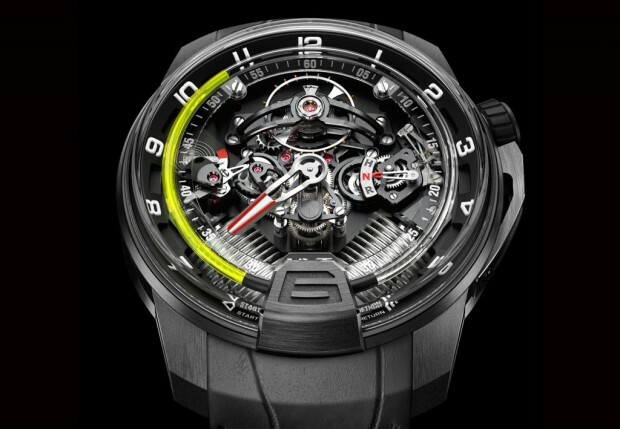 The HYT team have announced the new H2, a further development of last year’s H1 using the same basic concepts and technology, this time created in collaboration with Renaud & Papi. You can read more about the H1 at the H1 link. The H2 is to be in a limited edition of 50 pieces. The case is 48.8mm (17.9mm thick) and made of black DLC titanium. There is a retrograde fluid for the hours, a jumping minute hand (which jumps to avoid the bellows), a power reserve indicator and a new temperature indicator for the fluid, whose err ‘fluidity’ is affected by temperature changes, thus affecting accuracy. This is something that I have heard was raised as an issue by some H1 owners, so this is perhaps a tacit acknoweldgement that there are optimal temperatures for this type of technology. The ‘H, N, R’ on the dial at three o’clock is the crown function indicator; ‘R’ is for winding, ‘H’ is for the time setting mode, and ‘N’ is the neutral position. The double barrel, visible through the back of the watch, has an 8-day power reserve. The H2 comes on a rubberised anthracite alligator strap and the price is, I believe, going to be around 90,000 CHF. It will be formally launched at Baselworld 2013. Watch HYT’s teaser video above for a more extensive glimpse of another ‘talking point’ piece from HYT. now .. that is cool, way beyond cool, sub zero in fact!!!! love it, the concept, the design, the watch, but don’t like the price… i’ll keep on dreaming! I was at the HYT authorised dealer here in Sweden yesterday and took a look at the HYT H1, and I must say that I’m impressed with this new brand. I’d love to see a HYT ‘in the metal’. No dealer here in AU. They’re absolutely fantastic, and surprisingly “affordably” priced. Ok, way out of my league but cheap compared Richard Mille etc.